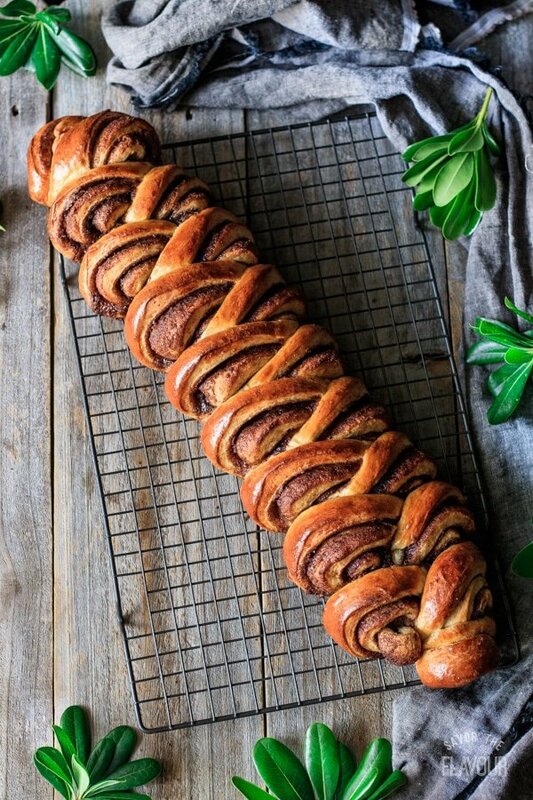 Kanellängd is a Swedish cinnamon bread that is perfect for Christmas morning. 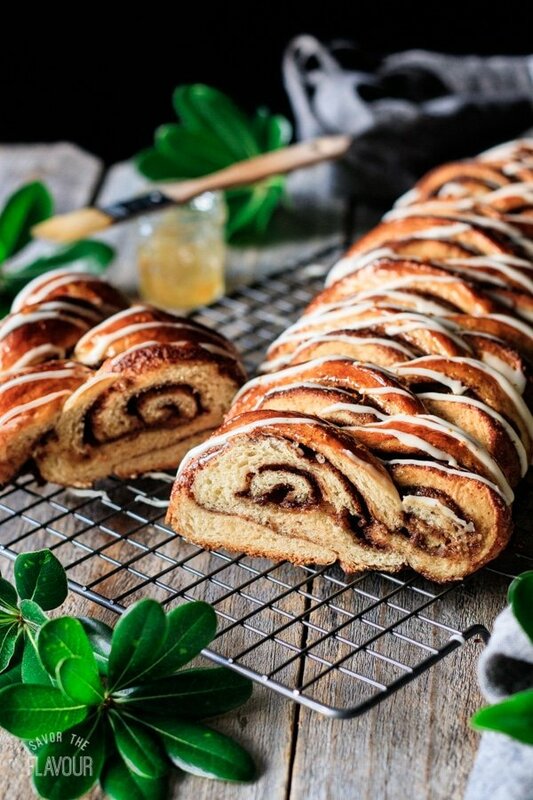 The buttery filling is flavored with cinnamon and cardamom, making a beautiful moist loaf that the whole family will love. 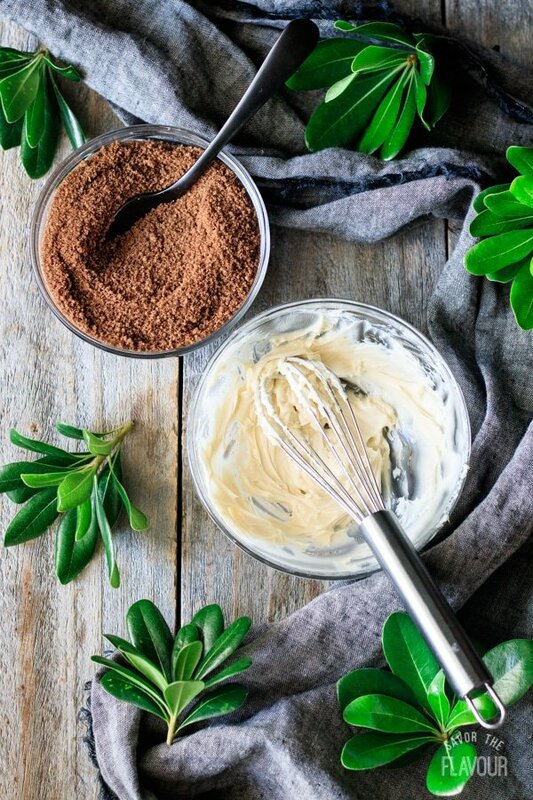 It’s a perfect dessert for the holidays! 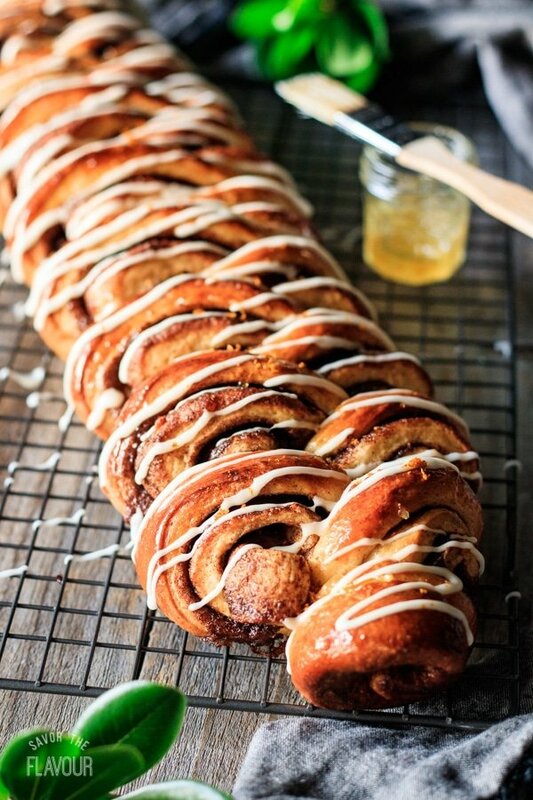 In fact, kanellängd is a variation of the Swedish cinnamon buns. 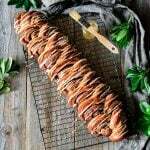 Instead of making separate buns, the dough and filling is shaped into a long loaf, which is sliced into pieces when served. This unique shape saves time, and makes a very impressive presentation. Here’s a short video from BBC Food about making kanellängd. Yes, kanellängd freezes very well after baking. Place it in a zip-top freezer bag or airtight container and freeze for up to a month. Can kanellängd be made ahead? Yes, you can make kanellängd ahead of time. 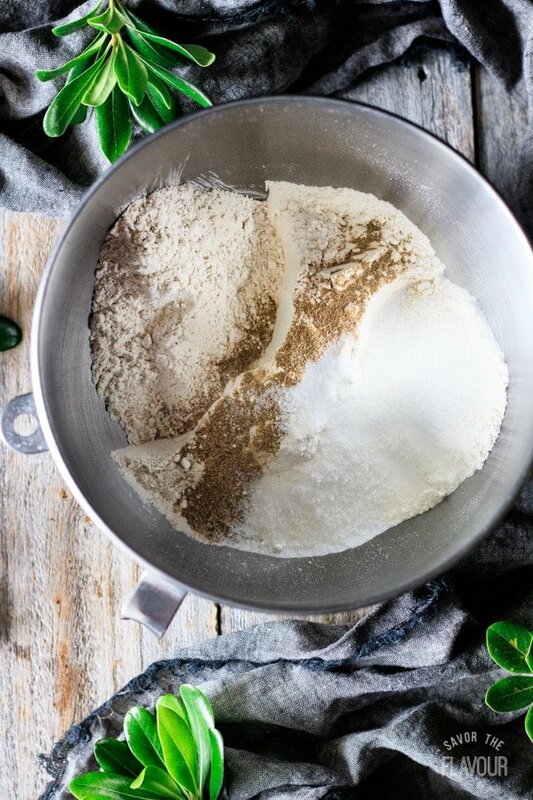 Make the dough the day before, and let it rise in the fridge overnight. Shape the loaf the next day, let it rise, and bake as normal. The rising will take longer, though, because the dough will be cold from the fridge. Stir together the milk and butter in a small saucepan until the butter has melted. 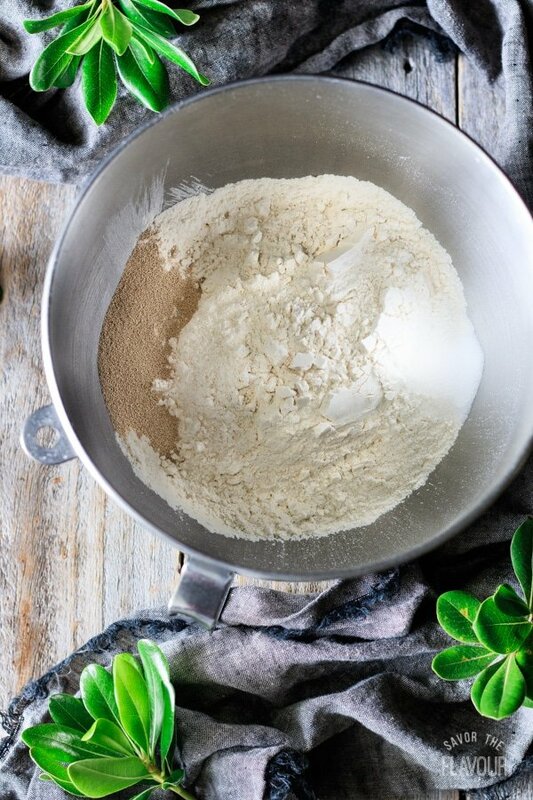 Let the mixture cool to 115 F.
Pour the flour into the bowl of a stand mixer and add the salt and yeast on opposite sides of the bowl, then mix each one in with your finger. Add the sugar and cardamom. Pour in half of the milk mixture and mix to start forming a dough. Keep slowly trickling in the milk as the mixer runs until a sticky dough has formed. 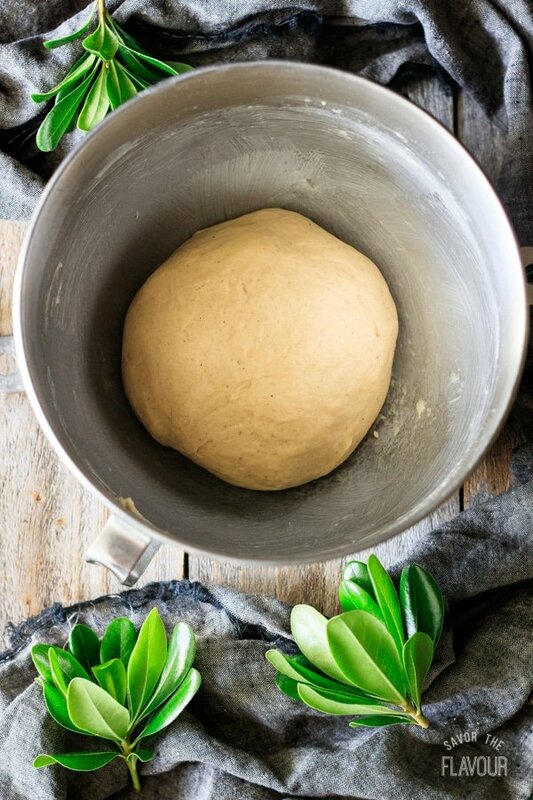 Switch attachments to the dough hook and knead until the dough cleans the bowl and passes the windowpane test (see instructions in the recipe below). Cover the dough tightly with plastic wrap and let it rise in a warm place until doubled in size, about 1 to 1 1/2 hours. 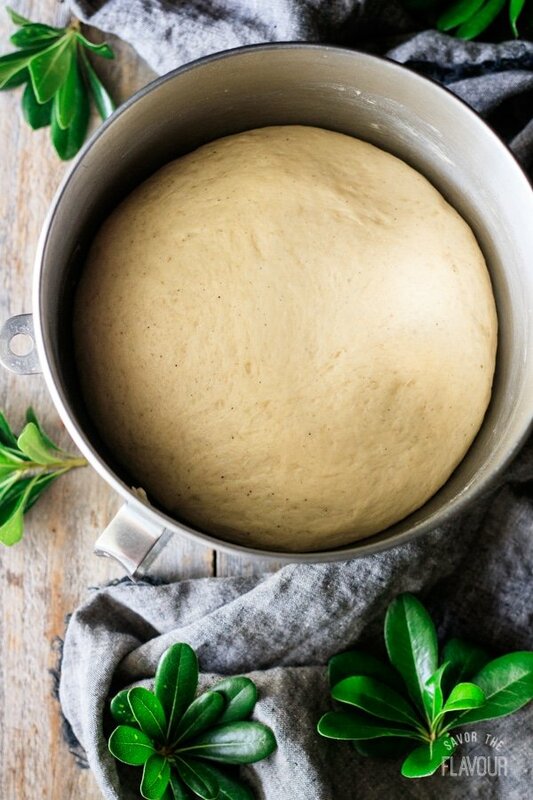 The dough should look like this when it’s done rising. While the dough is rising, mix together the brown sugar, cinnamon, and cardamom. In a separate bowl, beat the butter and vanilla extract together until blended. Turn the dough out onto a floured surface and punch it down all over to knock out the air. Roll it into a 12 by 15-inch rectangle. Evenly spread the vanilla butter over the surface of the dough. Pour the sugar mixture into a small sieve and scatter it evenly over the buttered dough. 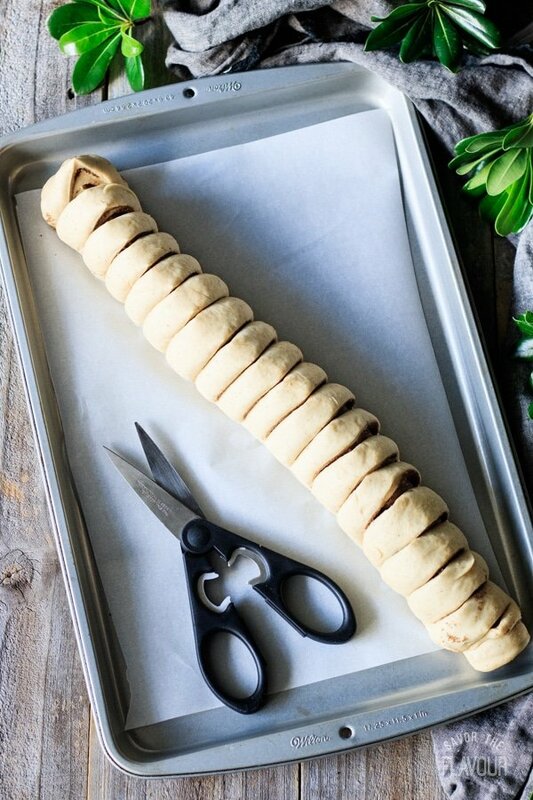 Roll up the dough from one of the long sides to create a log, pinching the seams and ends to seal. 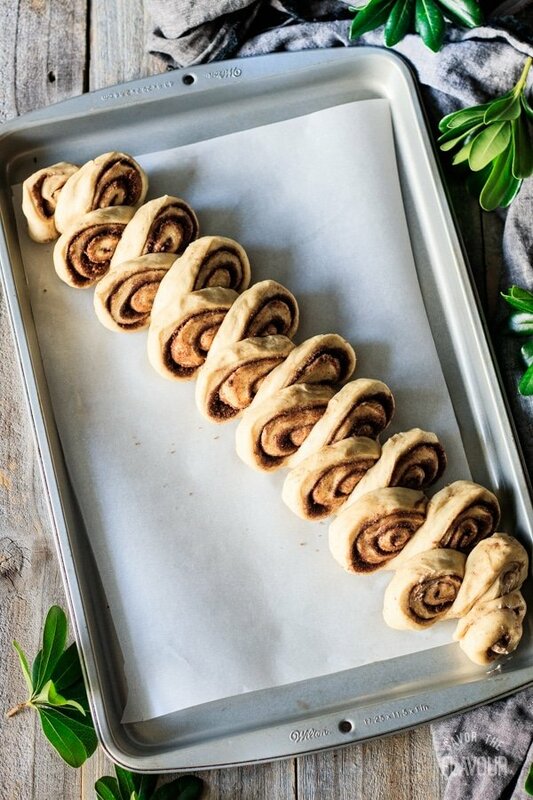 Place on a rimmed, parchment-lined cookie sheet. Snip the loaf almost all the way through with kitchen shears every 3/4 inch. 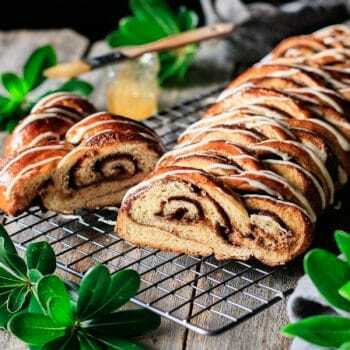 Pull out the slices from side to side and flatten them so the swirl shows. Cover the dough with plastic and let it rise until noticeably puffy and the dough springs back when gently poked with a fingertip, about 45 minutes to 1 hour. Trim away excess parchment paper from around the loaf. Bake the loaf at 415 F for 25 minutes, until the loaf has an internal temperature of 190 F. Cover with aluminum foil if it’s browning too fast. 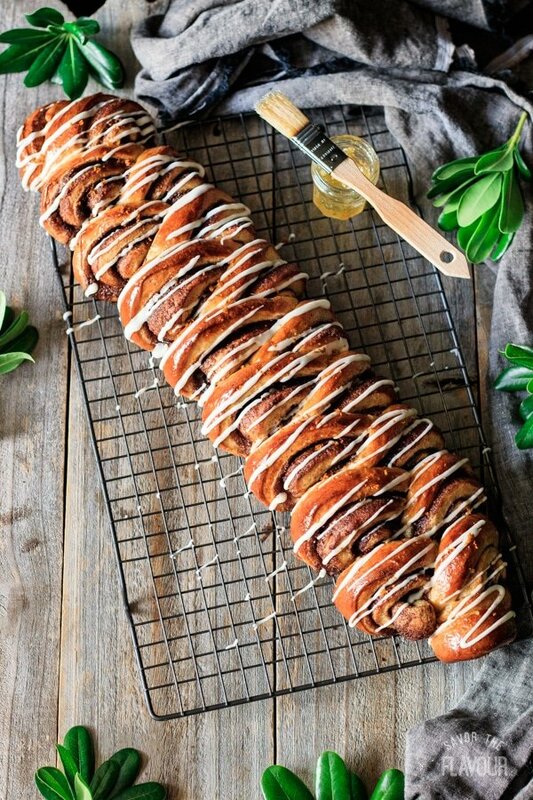 Once the loaf has cooled completely, brush it with orange marmalade, drizzle with icing, and sprinkle with orange zest. Slice and enjoy! Use the windowpane test (instructions in recipe card) to see if the dough is kneaded enough. 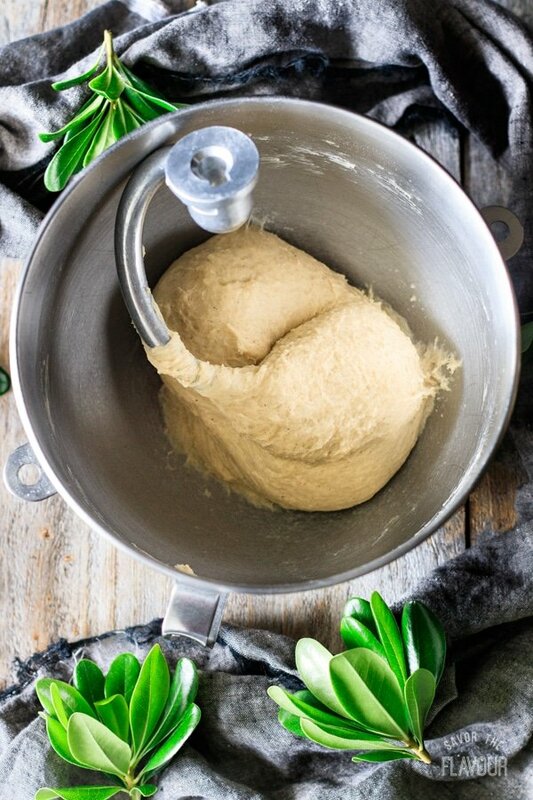 Make the dough the night before and let it rise in the fridge overnight. Shape the loaf and let it rise the next day, but it will take longer to rise because the dough is cold from the fridge. 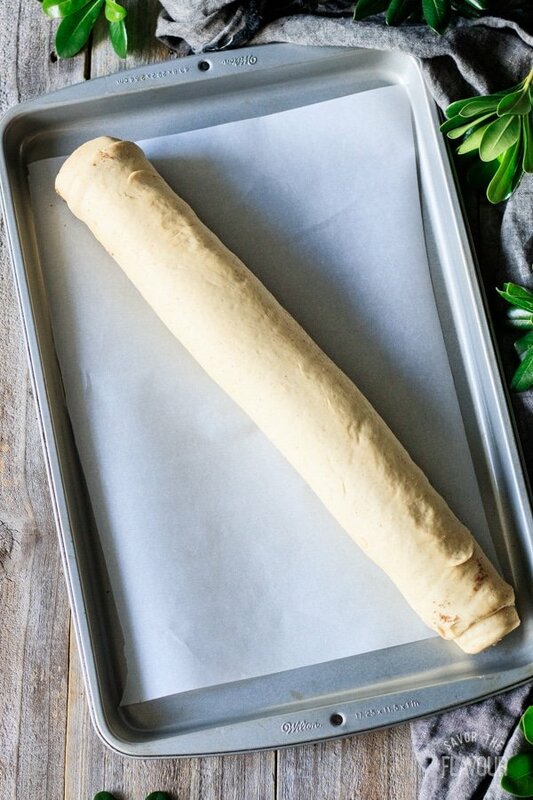 Roll the dough into a tight log to get a good shape. Make sure to put the kanellängd on a cookie sheet with sides. The butter and sugar in the filling will melt and bubble during the baking, and if the pan has no sides, it can drip off the pan and cause an oven fire. Is your kanellängd dense and doughy? 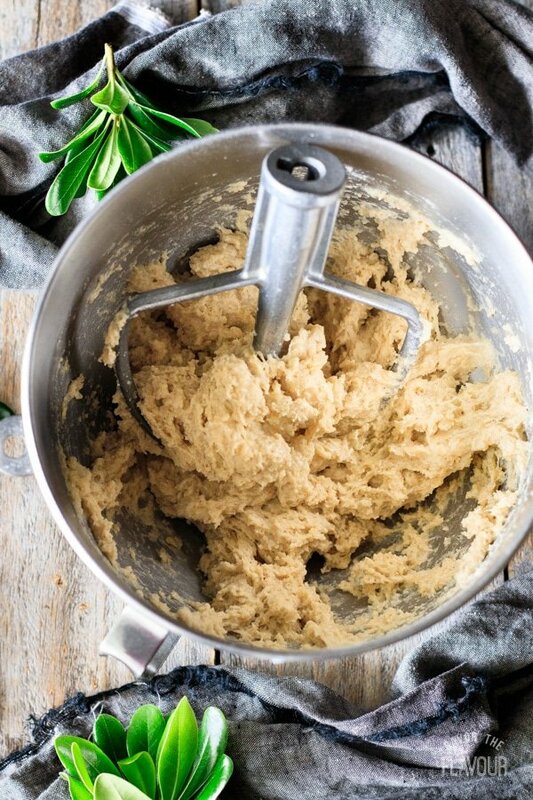 The most probable cause is that the dough didn’t rise long enough. Also, it could be underbaked, the oven may not have been hot enough, or it didn’t cool completely before serving. Is your kanellängd dry? It’s overbaked. Is your kanellängd burnt? Make sure to stack the cookie sheet on top of another cookie sheet to insulate the bottom of the kanellängd, and cover the top of the loaf with aluminum foil once it’s nicely browned. 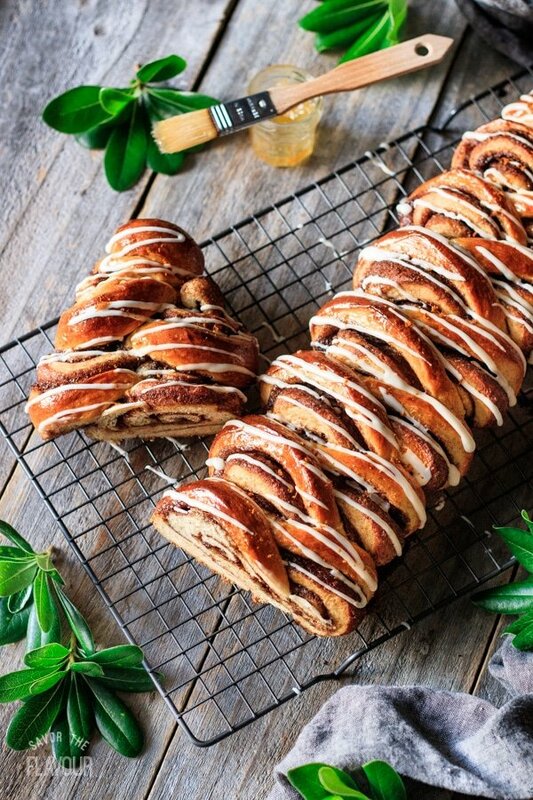 Looking for more delicious sweet bread recipes? You’ll want to give these ones a try. Pulla: Finnish Cardamom Bread: this soft and fluffy sweet bread is a Finnish favorite. 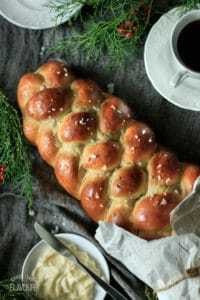 St. Lucia Buns: delightful saffron buns traditionally served in December. 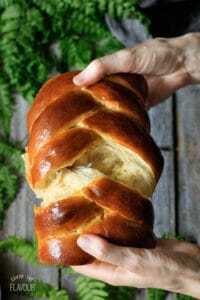 How to Make Easy Challah Bread: this Jewish Sabbath bread is sure to become a family favorite. Did you make this kanellängd? Please leave a star rating below to share how you enjoyed it. 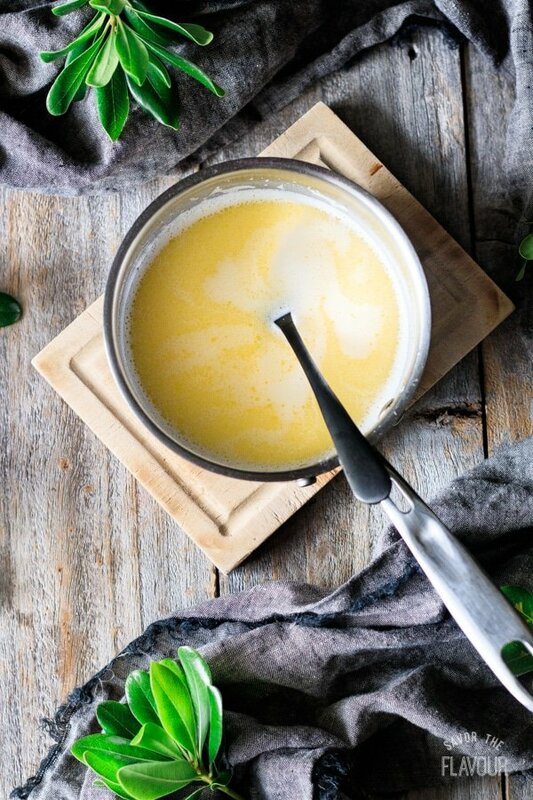 Stir the butter and milk in a small saucepan over medium heat until the butter has melted and the mixture is warm. Let the mixture cool to 115 F.
Place the flour in a large mixing bowl. Add the salt and yeast on opposite sides of the bowl, stirring in each with your finger. Add the ground cardamom and caster sugar and stir the whole mix together. Pour in the egg and half of the milk mixture. Mix on low speed with the paddle attachment to start bringing the dough together. 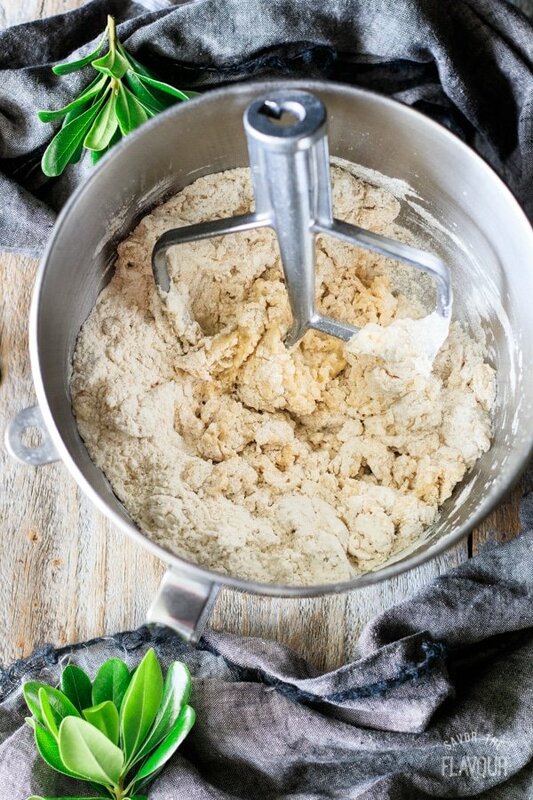 Gradually add more milk as the mixer runs until a soft, somewhat sticky dough is formed and all of the flour is picked up from the bowl. Switch attachments to the dough hook and knead until the dough is smooth, not as sticky, and has cleaned the sides of the bowl. The dough must also pass the windowpane test. Break off a lump of dough and stretch it between your hands to form a windowpane shape. If the dough stretches until translucent without breaking, it’s been kneaded enough; if it breaks, knead for a minute longer and check again. Shape into a ball, place in a lightly buttered bowl, and cover tightly with plastic wrap. Place the dough in a cold oven and put a pan of boiling water on the shelf below the dough to create a warm, steamy atmosphere. Let it rise until doubled in size, about 1 to 1 1/2 hours. 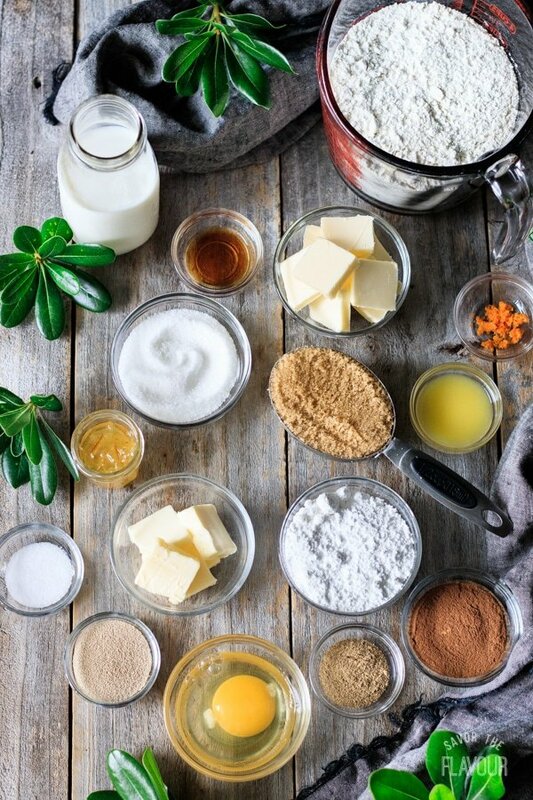 While the dough is proving, mix together the sugar, cinnamon, and cardamom in a medium bowl until thoroughly mixed, then set aside. Cream the butter and vanilla extract until all the vanilla is incorporated. Set aside. 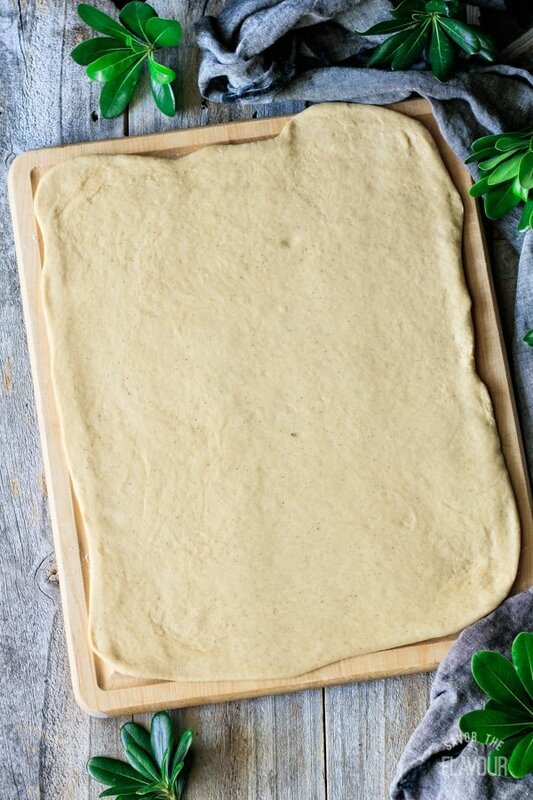 Prepare a 11 by 17 inch rimmed cookie sheet by lining it with parchment paper. Turn the dough out onto a lightly floured surface and knock it back by punching it down all over. 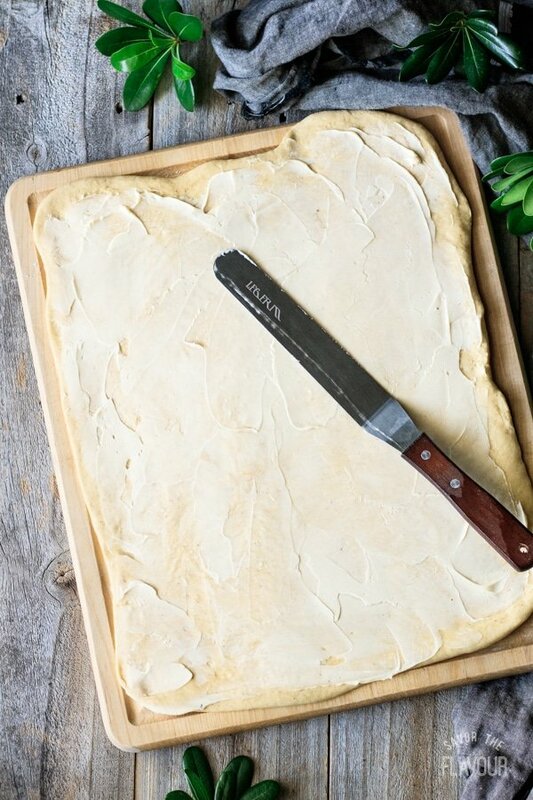 Roll out the dough thinly into a large rectangle, about 12 by 15 inches. 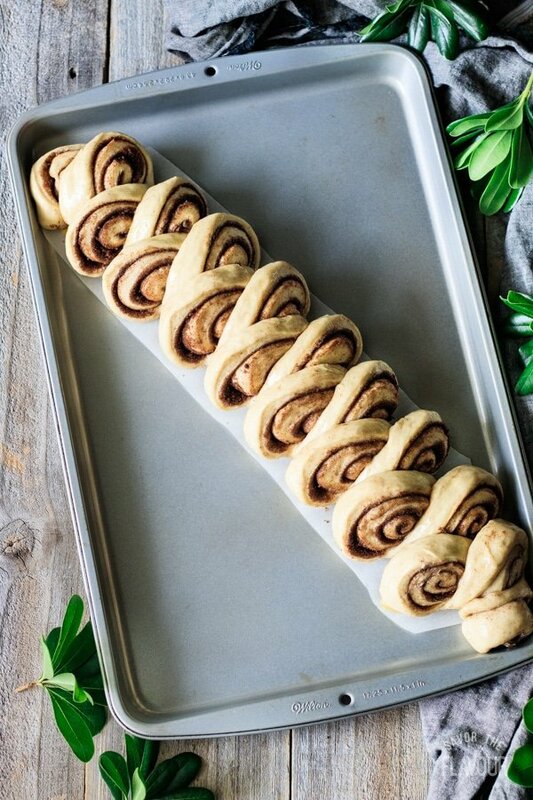 A larger rectangle means a larger loaf and more swirls. 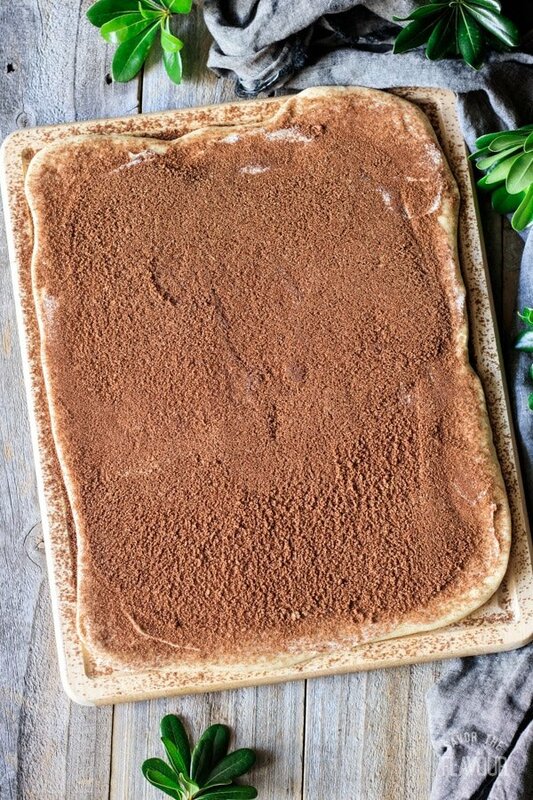 Spread the vanilla butter evenly all over the dough, then sprinkle the cinnamon-sugar mixture evenly all over the butter with a small sieve. Starting with the long edge closest to you, roll up the dough very tightly. 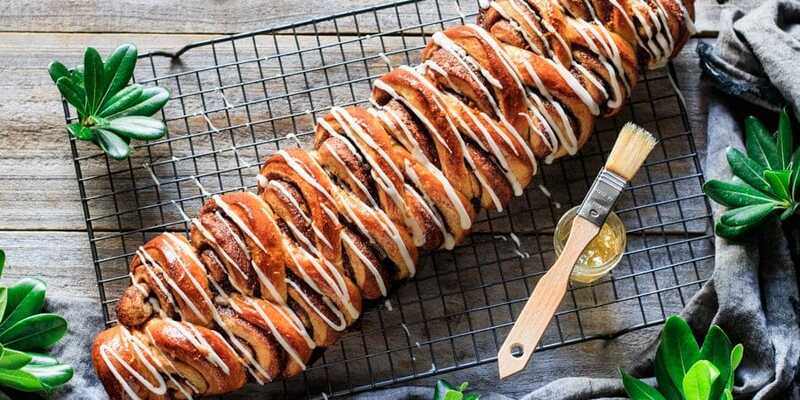 Pull the roll towards you as you go to stretch the dough and create a taut roll. Pinch the seam underneath and the ends to seal, then place it on the prepared cookie sheet. Using a sharp, clean pair of kitchen scissors, snip the dough every 3/4 of an inch, cutting almost all the way through. Pull out the slices, alternating sides. Flatten the slices slightly. Put the cookie sheet inside a clean plastic garbage bag, tucking the excess under the pan. Leave the dough to prove until the dough springs back when lightly pressed with a fingertip, about for 30-45 minutes. About 15 minutes before the bread is done proving, preheat the oven to 415 F.
Brush the kanellängd all over with the beaten egg and trim off the excess parchment paper, as it will turn brown in the oven. Stack the cookie sheet on top of another cookie sheet to insulate the bottom of the bread, helping it not to burn as quickly. Bake it in the middle of a 415 F oven for 25-30 minutes. Watch the bread closely, and cover it with foil after 10 minutes if it’s getting too dark. Let it cool completely on a wire rack. Sift the powdered sugar into a medium bowl and stir in enough orange juice to make a pourable icing. Spoon the icing into a corner of a plastic sandwich bag, twist the top, and snip off the corner to make a piping bag. Brush the sieved marmalade all over the bread, then drizzle with the orange icing. Sprinkle the clementine zest over the loaf. Serve in large slices. Leftover kanellängd freezes very well. Awesome, Tiffany! I’m so glad that you enjoyed the kanellangd, and thank you for sharing the photos! It would taste wonderful with coffee, too. This was a well written recipe – mine was a success! I’d post a picture but can’t seen to do that – looks lovely. So well written. Lovely recipe. I would do this bread over again in a heart beat.